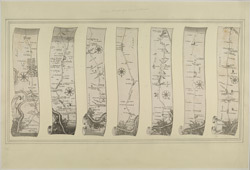 These seven strip maps are taken from John Ogilby's "Book of Roads", the precursor to the modern road atlas. Each strip describes a section of a particular route out of London. Drawn from a survey on a scale of one inch to the mile, the atlas describes all the landmarks and crossroads featuring along a particular route and indicates the distance in miles between them. Ogilby's was the first atlas to consistently record the "postal miles" whose length,1760 yards, had been prescribed by statute in 1593.